Blooms of opportunistic macroalgae (e.g., seaweeds such as red algae Laurencia intricata and Spyridia filamentosa; brown algae, Dictyota spp. and Sargassum filipendula; and green algae, Enteromorpha spp., Codium isthmocladum, and Halimeda spp.) have caused problems in many coastal regions. These species out-compete, overgrow, and replace seagrass and coral reef habitats, resulting in reduced light availability to bottom communities, lower productivity, habitat loss from low oxygen conditions, and eventual die-off of sensitive species. Some macroalgal blooms have been linked to nutrient enrichment of coastal waters. Some invasive macroalgae pose a double- edged problem: not only are they able to out-compete seagrass and more desirable species, but some may also be toxic, such as Lynbya majescula, and exposure can lead to skin rashes or other serious problems for humans or animals. Macroalgal HABs have impacted coral reefs off southeast Florida in recent decades. 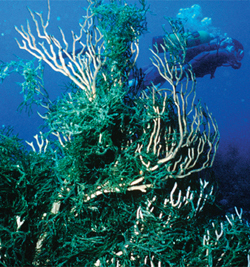 These phenomena began during a regional drought in 1990-1991 when the native green seaweed Codium isthmocladum formed massive summer blooms on deep reef communities in eastern Florida. The excessive biomass of these HABs resulted in hypoxia and anoxia in hear-bottom waters, causing die-off of hard and soft corals, sponges, and other reef biota, resulting in an overall decrease in abundance and diversity of reef fishes. This was followed by expansive blooms of several Caulerpa spp. in 1997 and 2001. Although summertime upwelling can provide natural nutrient subsidies to these macroalgal HABs, stable nitrogen isotope and water column nutrient data suggest a linkage to land-based discharges of both wastewater (septic tanks, injection wells, ocean outfalls) and agricultural runoff.